I don’t know if I’m just getting boring in my old age but going out just isn’t what it used to be. Over the last five or so years I have swapped the nightclub for the cafe and probably piled on a few pounds in the process. But even though I tend not to go ‘clubbing’ much anymore, I still enjoy a few drinks down the pub with friends. The biggest problem for me though is the journey home. I’d rather not spend two hours on London’s unpredictable and unsavoury night busses, thank you. Enter Tune Hotels. You may have read the review of our stay at the Liverpool Street branch and we liked it so much that we headed back to the King’s Cross branch. It was the night of our friends 30th and after one too many mixed beverages and definitely too many shots of tequila we stumbled back to the hotel for a few hours kip before check out at 10am. 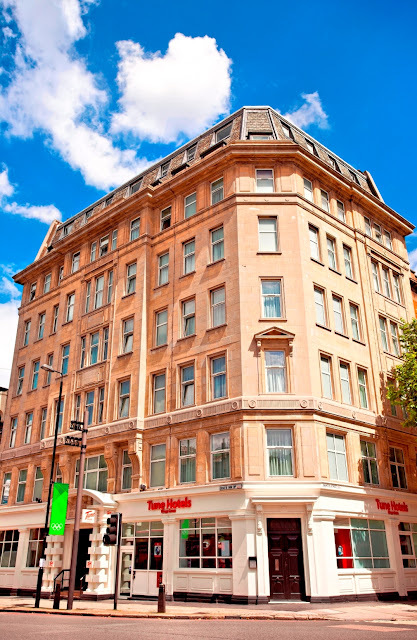 Tune Hotel King’s Cross is a short 5 minute walk from the station and housed in an old grand building. If you are not familiar with the hotels, they are based on the ‘add on’ model and little extras such as internet, an entertainment package, a hairdryer and towel and toiletry rental comes at a cost. We checked in, picked up our towels and soap, went in search of our room for the night and were pleasantly surprised on entry. The room was spotless with an en suite shower room and a window. We had a quick comfortable nap before we headed to the pub and a good uninterrupted night sleep when we arrived back from the pub. There’s not really much else to be said about Tune Hotels. There isn’t a fancy restaurant or cocktail bar but you don’t always need that. And at from £55 a night in Central London, quite frankly I think this is one of the best options for any London traveller. It doesn’t sound entirely un-hellish. The office-like blinds present a rather grimulous face to the street, too.